That's it! I'm finished with NaNoWriMo and I've won! 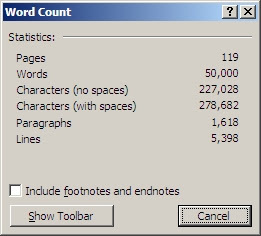 My friend Patty's wordcount is soooo close. I'm confident she'll cross the finish line today. I'm pleased to report that Younger Daughter, unofficially competing, completed over 30,000 words of her own. Whoo-hoo! 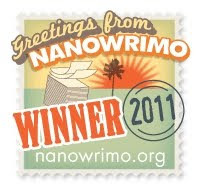 NaNoWriMo has a Young Writers category, and next year I'll encourage her to sign up. Now that this project is complete, I need to get hustling on other things. I have a magazine article due tomorrow, a column due Friday, and a nonfiction book I need to finish up since it's being shopped around by my agent. Onward! 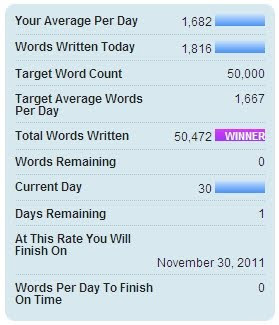 My sincere thanks to Patty (who encouraged me to sign up), to the fine folks at NaNoWriMo, and to everyone who offered support and/or participated themselves. Glad it's over, and glad I have 50,000+ words written on something I never thought I'd do. Wow, you are Mrs. Incredible! Way to go!!! CONGRATS! Isn't it a great feeling to have finished? Hope all goes well with the rest of your projects. Congratulations, well done! And a special congratulations to your Youngest Daughter; there are very few (if any?) of her age that can string together 30,000 words in a cogent fashion! Congratulations! It's been a lot of fun following along with your progress. Congratulations!!! When you started, I was stunned by the enormity of the project, but you did it! That is just amazing! Boy, you are really something! Make a promise and you follow through - takes courage and grit -you got 'em both! Congrats to Younger Daughter, too! You are one busy, BUSY bee, Patrice! If only we had someone like you running the country. Oh, we know you probably think you're too disorganized and running around like a headless chicken. But, if you were so disorganized, you'd never get all the things done that you do! You rock, kiddo. Awesome! Bravo to you both! and, to Oldest Daughter too! Congratulations! What a wonderful acomplishment for you and your daughter! Congratulations, It is such a cleansing & uplifting feeling when you accomplish a writing project. Plus, it is such an inspiration to hear your dedication during this time. Thank you for sharing your triumph. Patrice, are you going to try and get the book published at some point? Will you be posting it for us to read? 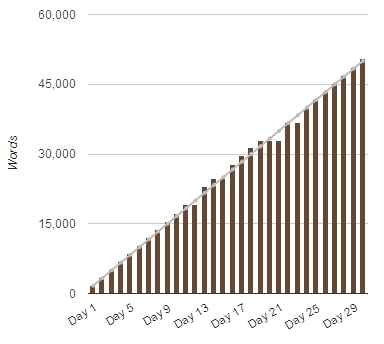 While I'm done with NaNoWriMo, I'm by no means done with the novel. I'm guesstimating its final word count will be in the area of 100-120,000 words. But for the moment I need to set it aside in favor of more pressing commitments, meaning the nonfiction which my agent is shopping around on my behalf. But I'm very interested in completing this fiction at some point and hope to make it my next major project.